India has suspended for indefinite period its military aid to Nepal in the wake of the royal coup in the Hindu Kingdom, authoritative sources in the Ministry of External Affairs told The Tribune this evening. External Affairs Minister K Natwar Singh today summoned the Indian, Ambassador in Nepal, Mr Shiv Shankar Mukherjee, for consultations. Should the Nanavati report on the 1984 riots be made public? 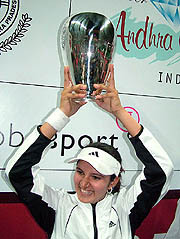 Sania Mirza oscillated between occasional brilliance and erratic shot selection but raised her game when it mattered most to create history and become the first Indian woman ever to win a WTA tour title in the $ 140,000 Hyderabad Open tennis tournament here today. In a sharp reaction to yesterday’s outburst by the outgoing Punjab and Haryana High Court Chief Justice, Mr Justice B.K. Roy, during an interview to a news channel, Union Law Minister Hans Raj Bhardwaj today remarked that the Chief Justice should be aware of the responsibilities that are attached to high offices such as the one held by him. 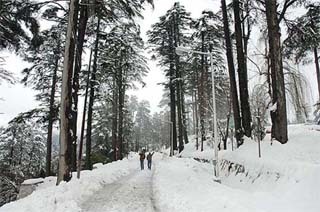 With still no communication with the 17 Indian Tibetan Border Police personnel posted in the Kehar sector of Chamba, a 10-member rescue team from the Mountaineering Institute will trek to the Saunthit post located at a height of 10,000 feet tomorrow. A hero’s welcome was accorded to Mr Aijaz Ahmad and his two daughters at their house here this afternoon, who returned after being stranded at Banihal on the Srinagar-Jammu National Highway for a week. In an apparent embarrassment to the ruling RJD ahead of the second round of elections in Bihar, the Election Commission today served a notice on the RJD over CDs featuring the post-Godhra riots in Gujarat and postponed polls in three seats in view of "inadequate" security arrangements. It is the booming of guns that is being heard distinctly amid the cacophony of poll campaign in Bihar. It is boom time for buying small arms as well. The Haryana Chief Secretary, Mr Sunil Ahuja, today met the Governor, Dr A.R. Kidwai, as the Chautala Government seems to be preparing for a confrontation with the Election Commission over the issue of appointing persons selected by the Public Service Commission and the Staff Selection Commission for various posts.